Are you alright mate? 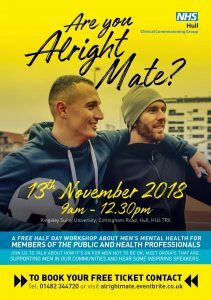 is a half-day workshop looking at men’s emotional health and is aimed at anyone with an interest in the topic of men’s mental health – members of the public & health professionals. The session will explore ways in which we can encourage more open talk about men’s mental health, and get the message out there that it’s ok for men to not be ok. The event will offer an opportunity to hear a range of local thought provoking speakers and a visiting keynote speaker with a particularly powerful message. With 25 years experience working for global company Unilever, Geoff tells a fascinating and powerful story about an episode in his own life which has caused him to become a very active campaigner breaking the stigma associated with Mental Health. Geoff has participated in a number of BBC programmes and campaigns regarding this subject, as well as writing and producing articles. He previously convened a meeting at No 10 Downing Street with David Cameron and CEOs from Footsie 100 Companies to address their role and agree actions to break stigma in the corporate world. He too provided some support to the Royal Foundation in their mental health campaign. There will also be chance to visit a range of stalls from services and community groups connected to men’s emotional wellbeing. Be the first to comment on "Are You Alright Mate?"